James Rodriguez (r.) laid on the ball for Arjen Robben to take his place as Bayern Munich's highest scoring non-German in Bundesliga history. From Arjen Robben's Bayern Munich record to a best ever start to a Bundesliga campaign for Augsburg and a landmark home win for ever-present Hamburg – we assess the key figures on what was an incident-packed Matchday 11. Borussia Dortmund have lost back-to-back Bundesliga games for the first time in two and a half years (In April 2015 under Jürgen Klopp). Schalke’s victory in Freiburg was their third on the road this season. That’s as many as they managed in the whole of 2016/17. RB Leipzig have won all four Bundesliga matches against promoted sides. They did the double over Freiburg last season, who had pipped them to first place in Bundesliga 2 the previous campaign, and have now beaten Stuttgart and Hannover at home this year. Schalke are unbeaten in five consecutive games for the first time in 2017. Kevin Volland scored his sixth goal of the season with his first shot and touch of the second half against Augsburg. He now has as many goals as the whole of last season. The Jupp Heynckes effect has really taken hold in Munich. The champions have not lost any of the seven competitive games since the treble-winner’s return, including four wins in the Bundesliga and progression to the last 16 in the UEFA Champions League and DFB Cup. Freiburg’s nine game unbeaten run at home, stretching back seven months, was ended with the 1-0 defeat to Schalke. Mainz are winless in their last 11 on the road. Only under Thomas Tuchel in 2011/12 have they gone on a longer drought on the road. Borussia Mönchengladbach’s Jannik Vestergaard has scored in three of his last four games. Since making his Bundesliga debut in April 2011, he has scored more goals from corners than any other player in the league (11). Bayer Leverkusen have never lost to Augsburg in 13 Bundesliga meetings, winning eight and drawing five. However, those five draws have come inside the last six encounters. Werder Bremen are without a win in 14 Bundesliga games – the longest run in their top-flight history. Augsburg’s total of 16 points at this stage of the season is their best ever in the Bundesliga. Hertha Berlin's Vedad Ibisevic scored the fastest goal of the season so far with his strike against Wolfsburg on Sunday clocking at 21 seconds. Hannover’s Jonathas has had a hand in a goal every 59 minutes this season (3 goals, 3 assists in 356 minutes). 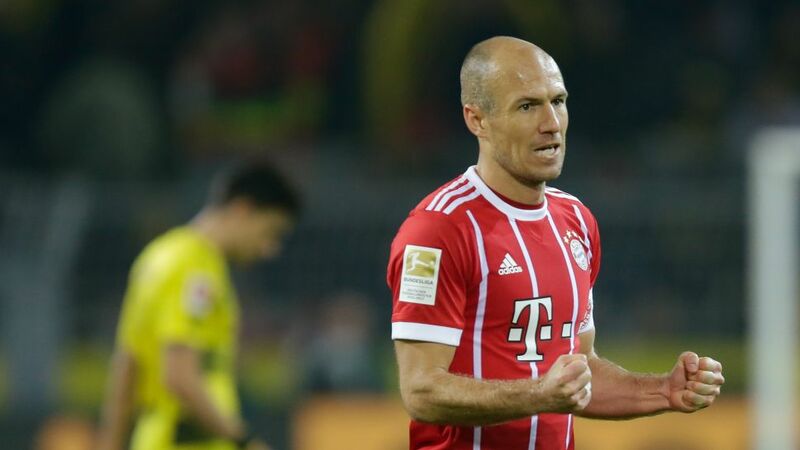 Arjen Robben found the back of the net for the 93rd time in the Bundesliga to make him Bayern’s record non-German goalscorer ahead of Giovane Elber. Robert Lewandowski scored his 162nd Bundesliga goal in the Klassiker victory over former club Dortmund. It moved him 11th on the league’s all-time scoring chart alongside current Bayern Chairman Karl-Heinz Rummenigge. Leverkusen captain Lars Bender make his 250th competitive appearance for the club. Aaron Hunt’s strike against Stuttgart ended Hamburg’s historic run of 461 minutes without a goal at home. Hamburg celebrated their 500th home win in the Bundesliga. Only Bayern and Bremen have reached the landmark quicker. Bayern scored their 500th goal in their 225th Bundesliga game under Jupp Heynckes. Only Udo Lattek and Ottmar Hitzfeld have overseen more goals for the Bavarians (736 and 507). Niklas Moisander ended Bremen’s 508-minute goal drought with his equaliser against Eintracht Frankfurt. It was the club’s longest ever run without finding the back of the net. Leipzig vs. Hannover was the 906th different match-up in Bundesliga history.